This article is about NPCs who are vampires. For the disease's effects on the player, see Vampirism. 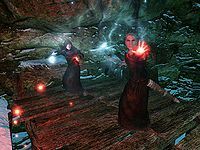 Vampires are NPCs in Skyrim afflicted with Sanguinare Vampiris. The disease causes them to physically change, giving them supernatural powers and making them immune to poison, but vulnerable to sunlight and fire. Vampires are undead and therefore susceptible to magical effects aimed at the undead but unaffected by Illusion spells unless the perk 'Master of the Mind' has been unlocked. Since they are NPCs, all vampires have black souls. Vampires usually make their lairs in caves and other dark places, and may also be found gathered around ritual sites in the wilderness. They are often accompanied by mortals called Vampire's Thralls. Vampires usually attack on sight, even if you are also a vampire. If struck by a vampire's Vampiric Drain spell, you can be infected with Sanguinare Vampiris, which, if not cured within three days, will transform you into a vampire. While most vampires encountered will have the tell-tale signs of vampirism, such as black and red eyes, some have no outward displays of vampirism and can only be discovered with use of Detect Dead - or through lack of aura from Detect Life (like Sybille Stentor and Alva, for example). All generic vampires are female; only boss-level vampires are male. The only exception to this is the vampire that appears in the "Vampire Trick" world interaction: this vampire uses the same data as the generic vampires below, but is always male instead of female. When the Dawnguard add-on is installed, in addition to several new vampires being added, changes to the physical appearance of vampires from the base game will be seen. Most vampires will have glowing yellow eyes and distorted faces, with bat-like noses, a red line from nose to chin, and ridges above their eyes (similar to Dark Elves). During the events of the Dawnguard quests, vampires will attack some towns or cities. Dawnguard also introduces the powerful Vampire Lords and the Volkihar vampire clan as a fully fleshed out faction. All vampires have a Drain Life spell which can drain health, stamina, and magicka at a rate of a few points per second. Low-level vampires can drain only health, mid-level vampires can drain both health and stamina, and the highest-level vampires can drain health, stamina, and magicka. Vampires also have an ability called "Chill Touch," which creates an ice hazard that deals 10 points of frost damage. All vampires of level 12 or higher have a leveled ability called "Vampire Touch", which grants a constant Fortify Unarmed Damage bonus. The "Vampiric Invisibility" spell allows vampires to become invisible for 20 seconds. 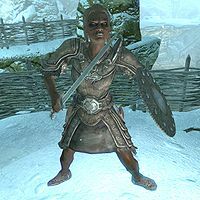 If Dawnguard is installed, vampires wear either vampire armor or vampire robes along with a pair of vampire boots. Vampires may carry miscellaneous items, including lockpicks, potions, gems, jewelry, and books, and have a 50% chance to carry a small amount of gold. On death, vampires drop vampire dust and have a 15% chance to drop a leveled potion or poison. The male vampire that appears during the "Vampire Trick" world interaction carries a leveled dagger (steel, orcish, dwarven. or elven) and may also carry some gold and a random scroll. ^1If Dawnguard is installed, the damage decreases from 15 points per second to 13 points per second. ^2If Dawnguard is installed, the damage decreases from 20 points per second to 14 points per second. ^1The Dawnguard add-on removes the Bone Breaker perk from all boss-level vampires. ^2If Dawnguard is installed, the damage decreases from 15 points per second to 13 points per second. ^3If Dawnguard is installed, the damage decreases from 20 points per second to 14 points per second. Alva Alva's House An agent of Movarth in Morthal. Arch-Curate Vyrthur(DG) Inner Sanctum An ancient Snow Elf vampire. Babette Dark Brotherhood Sanctuary A three-hundred-year-old child member of the Dark Brotherhood. Fenrik(CC) Quicksilver Mine An ex-Vigilant of Stendarr found within Quicksilver Mine in Dawnstar. Feran Sadri(DG) Volkihar Keep An alchemist Vampire Lord. Fura Bloodmouth(DG) Volkihar Keep A Nord warrior found in Volkihar Keep. Garan Marethi(DG) Volkihar Keep A mage formerly of House Dres. Hern Half-Moon Mill A lumberjack and the target of a Dark Brotherhood assassination. Hert Half-Moon Mill A lumberjack and the wife of Hern. Hestla(DG) Volkihar Keep A smith and former member of the Companions. Laelette the Vampire Morthal A Breton woman turned into a vampire by Alva. Lokil(DG) Dimhollow Crypt A vampire searching for the artifact sealed in Dimhollow Crypt. Lord Harkon(DG) Volkihar Keep The Vampire Lord patriarch of the Volkihar clan. Malkus(DG) Forebears' Holdout The captor of the Moth Priest Dexion Evicus. Modhna(DG) Volkihar Keep A low-ranking member of Lord Harkon's court. Movarth Piquine Movarth's Lair The subject of the book Immortal Blood, who is attempting to conquer Morthal. Namasur(DG) Volkihar Keep A Redguard vampire living at Volkihar Keep. Orthjolf(DG) Volkihar Keep A warrior vampire and Vingalmo's rival. Rargal Thrallmaster(DG) Volkihar Keep The overseer of thralls and cattle at Volkihar Keep. Ronthil(DG) Volkihar Keep An assistant to Feran Sadri and an expert Speech trainer. Salonia Caelia(DG) Volkihar Keep An Imperial vampire involved in The Bloodstone Chalice. Serana(DG) Dimhollow Cavern A Vampire Lord found sealed in a sarcophagus in Dimhollow Cavern. Stalf(DG) Volkihar Keep Salonia Caelia's accomplice during The Bloodstone Chalice. Sybille Stentor Blue Palace The court wizard for Elisif the Fair in Solitude. Valerica(DG) Soul Cairn The wife of Lord Harkon and mother of Serana. Venarus Vulpin(DG) Redwater Spring An Imperial vampire in search of the Bloodspring of Lengeir's Feast. Vighar Bloodlet Throne An elderly vampire hunted by his descendant, Dengeir of Stuhn. Vingalmo(DG) Volkihar Keep A mage vampire and rival of Orthjolf. Vampires are sometimes accompanied by a few monsters, which will vary depending upon your level. The monsters will be the same level as the minimum PC level listed in the table below (so at levels 6-11, the Frostbite Spider companion will be level 6, and so on). Dark Ancestor: Destroy Dengeir's risen ancestor, the vampire Vighar. Night HunterCC: Claim the belongings of a Haafingar vampire hunter. Unholy VigilCC: Investigate the mysterious disappearances of Vigilants of Stendarr in the Pale. "...still always hungry... there's no prey down in this hole... need to hunt more... all this hiding and skulking around, pah..."
"...first kill is always the best... the blood has never tasted as sweet since..."
"...I won't hide down here forever... gather a few of the brethren, we'll strike out on our own..."
"...maybe the clans have it right... hunting's so chancy... why not keep a few thralls... blood whenever you want it..."
"...blood... so hungry all the time now... need to hunt again soon..."
"...she said I'd forget, and usually I do, but sometimes... still remember their faces, their pleading..."
"...Dawnguard getting to be more than a nuisance... gather some of the hunters... teach them a lesson..."
"...the clans think they're better than us... putting on airs... pah, they'll be the first to burn when the mortals get organized..."
"...just fed but still hungry... blood... all I can think about these days... last kill was so good... just the right amount of struggle..."
"I don't converse with my prey." "Don't speak to me, meat." "Out of the way, meat." "Ohh... but I will have your blood..."
"My thirst will be sated..."
"Oh, I can smell your blood..."
"Is that your best, mortal?" "You dare to interfere with me?" "I knew I smelled mortal blood!" "Now your blood is mine!" "Pah, your blood is foul." "Soon... soon your blood will be mine..."
"Why fight me? Your blood is already mine." "Mortal fool, you can't stop us." "We own the night, fool." "The night belongs to us." "The Tyranny of the Sun has been broken!" "The sun cannot protect you any more!" "Behold the power of Night!" "You blood will not protect you from me." "You're no match for me, fledgling." "Stop struggling. I'll give you a swift and beautiful death." "Let me show you how mortal you still are, vampire." "This is my hunting ground." "You should not have come here, vampire." "There's no blood here for you." "You've seen your last dawn. I bring the night." "I'll drink you dry, mortal!" "Your blood will not protect you!" "It's the Dawnguard! Let none escape!" "When will you fools learn? The night is ours!" "I love it when dinner walks right into my arms." "No... my blood is strong..."
"Death is nothing to me..."
"I do not fear death." "And so you learn the power of the night." "Is that all of them?" "And now for the feast." "We may feed again today." "Running is your only chance to live." "Whoever did this is mine." "Someone will bleed for this." "I will avenge you, brother." "I will avenge you, sister." "Running will warm your blood nicely." "The scent has gone cold." "I was hoping to feed." "You had your chance to escape, vampire." "You should have kept running." Regular vampires have a morality of "Any Crime", which means they're willing to commit any crime, but boss-level vampires have a morality of "No Crime," which means they are unwilling to commit crimes of any sort. Because of their aggression, however, they will still attack you on sight. Chill Touch may never disappear and continue afflicting you until you die. ? With Dawnguard installed, the Voice of the Sky blessing will prevent vampires (and their animal companions) from turning hostile. Thralls and Gargoyles remain adversarial, however. For historical information about vampires, see the lore article. This page was last modified on 5 March 2019, at 18:09.